Trails are around the golf course and in the woods at the Tupper Lake Country Club and can be accessed from Big Tupper alpine area OR from the Tupper Lake Country Club. Mostly easy grades on old logging roads, one trail will take you to the foot of Big Tupper alpine ski area. This all volunteer operation does not charge a trail fee. The scenery is nice and it’s a nice change if you want an easier day and a break from big hills of Mt van Hoevenberg. Worth the trip. 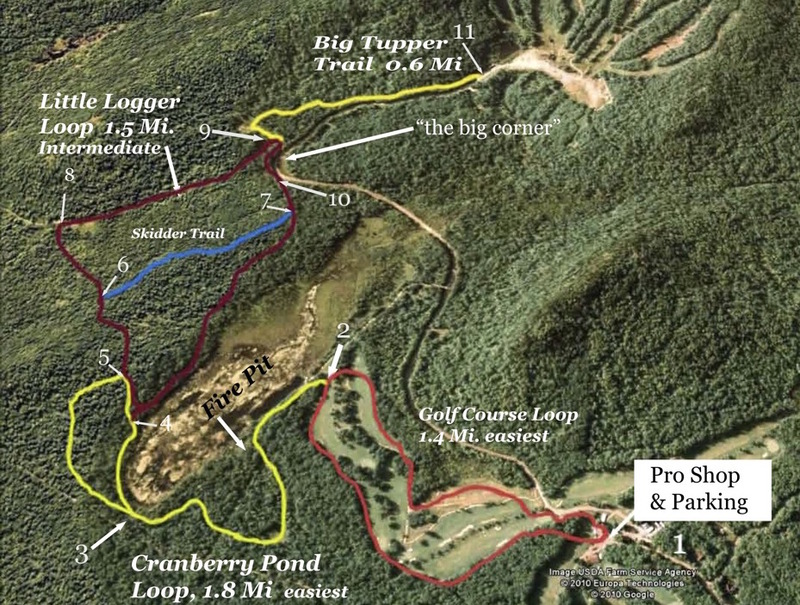 The trail system includes 3.2 miles of beginner terrain (Golf Course and Cranberry Pond Loops), as well as 2.1 miles of more challenging trails (Little Logger, Big Tupper Trail). To access the trails, you can park at the Country Club or Big Tupper Ski Area. Trail maps are usually posted along the route. Golf Course Loop: The trail from the Country Club loops the cart paths on holes 4 through 9. This is a nice gentle ski with wide open spaces along the edges of the fairways, and only a few short hills. The total change in elevation is about 75 feet. Cranberry Pond Loop: This trail breaks off of the Golf Course loop near the 7th Tee Box. From there, it follows the old logging road around Cranberry Pond. The trail between the golf course and junction “3″ is flat, and offers nice views with an 50 feet of vertical rise. Little Logger Loop: This trail takes you from the backside of Cranberry Pond, to the “Big Corner” and back. This is an intermediate trail with about 100′ of total elevation gain. While the trail is more challenging, it goes through a quick study of Adirondack forests: From pond edge, to hardwood forest to spruce swamp and back – all in 1 1/2 miles. Big Tupper Trail: This trail takes you from the “Big Corner” to the parking area at Big Tupper Ski Area. This .6 mile stretch has it’s challenging moments, but they are short lived. The net elevation change is less than 20′ from the sign post at “9″ to the parking lot (“11″).